Sister Louise Dunn has lived in the Alta Vista area for about 27 years, and has watched the changes in the Alta Vista area – the growth of houses from the fields to the emergence of the city, but it is the people in the area who make it great for her. Sister Louise was the youngest of a large family. 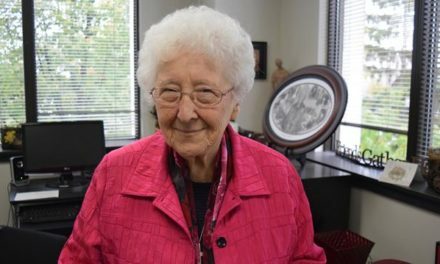 She grew up in Toronto, became at nun at 18 and joined the congregation of Notre Dame. She had a successful 28 year career as a teacher and eventually became Vice Principal of St. Patrick’s High School where she started to notice the impact drugs and alcohol was having on her students. In the beginning of her ministry, she worked with the alcohol addicted, and then it became a combination of alcohol and drug addiction. The students would often come to talk with her and her work evolved from there. She was always available after school for the students, but did not discuss their issues with the parents. Marion Dewar was the school nurse at the time. In the mid-70’s she wondered what people in the addiction counselling field would choose if they could do it all again, and she asked five individuals. The general consensus was that they would have chosen the same field again, but would begin with a specific area such as women versus the actual treatment centre. In the mid-80’s, there was a limit to the services that were available. It was a privilege to be involved in this project – a recovery journey. How did one live this journey while recovering from addictions? Serenity Renewal was created and originally financed by the congregation of Notre Dame starting November 15, 1983. 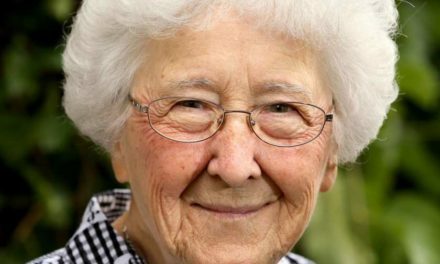 Alexis Smith, who co-founded the centre with Sister Louise Dunn, retired to Nova Scotia three years ago. Serenity Renewal for families has served over 100,000 people since it was founded. It counsels and provides counselling and workshops for addicted individuals, their children and families. They serve over 2,500 people every year. They’re just a small charity, but one which fills gaps in the system with novel programs for children and adults, offering them free of charge if need be. Addiction affects everyone in the home, not just the individual with the direct problem. In any given year, 1 in 5 Canadians experiences an addiction problem. Serenity Renewal is a team of volunteers, a Board of Directors, and a staff psychologist. Now it is funded by fees, etc. but no one is turned away. Sister Louise is a very good listener who is passionate about her project. She’s a sweet but no-nonsense nun who has a tremendous reputation in the 12 step community for getting results – often times with those who have been battling addictions for years. She has seen the ups and downs in the progression of lives, and encourages whatever lifestyle the individual on the recovery journey has chosen. She is now 83 years young and works 8 hours a day, 40 hours a week for this organization. Recently Sister Louise was recognized for her work by the recovery community at City Hall, as part of Recovery Day, a gathering of more than 50 agencies, people in recovery, and former clients of Sister Louise. 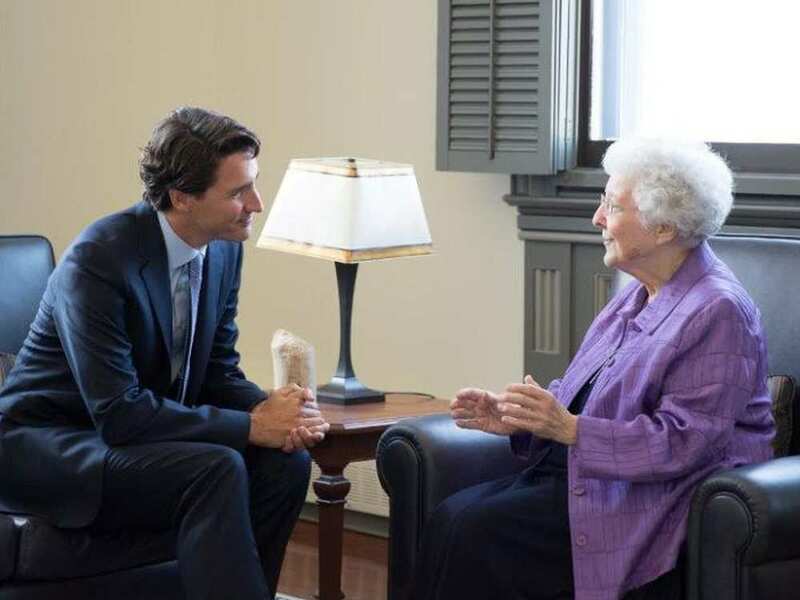 Back in July, she was invited to visit with Prime Minister Justin Trudeau. Mr. Speaker, I am delighted to announce that my constituent and friend, Sister Louise Dunn of the Congregation of Notre Dame, is receiving the annual Recovery Day Ottawa Award for commitment and perseverance in supporting recovery for families affected by addiction. As a high school teacher, she became concerned about the terrible impact of drugs and alcohol on her students, so at the tender age of 48, she retrained as an addiction counsellor. Thirty-three years ago, she co-founded Serenity Renewal for Families in my riding of Ottawa South. Sister Louise has overseen the development and implementation of a wide range of unique dynamic programs that have helped thousands of individuals and families cope with the long-term effects of addiction. Sister Louise exemplifies what it is to be a Canadian by graciously helping those who are most in need. 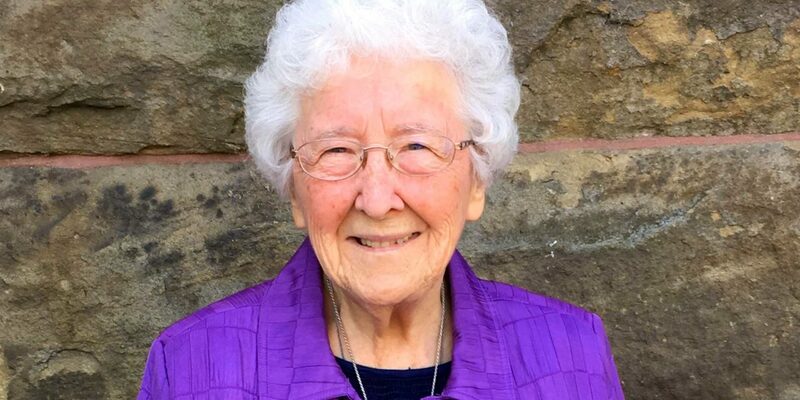 We at VISTAS recognize the wonderful work of Serenity Renewal and the gifts that Sister Louise has given to this very special, caring ministry of love. Thank you for your ministry, Sister Louise. For more information on Serenity Renewal for Families and how you can help, please contact Mike Beauregard, Director of Development and Philanthropy, at mbeauregard@serenityrenewal.ca or 613.523.5143 Ext. 225.